An estimated 3 million Americans carry a loaded handgun on their person every day, according to a new study published in the American Journal of Public Health. Researchers from the University of Washington, Harvard University and the University of Colorado conducted the National Firearms Survey in 2015. Of the 4,000 U.S. adults who participated in the online survey, 1,500 of them were handgun owners. They were asked how often they carried a loaded handgun when they were out of their homes. In addition to the 3 million who carry daily, researchers found that 9 million Americans carry a gun once a month. People in that category were disproportionately likely to be conservative men ranging in age from 18 to 29 and living the south. Four out of five of those who carried said protection was the main reason they armed themselves. About 6 percent said they’d been threatened by someone with a gun in the last five years. The study comes as more and more states have eliminated laws mandating permits in order to concealed carry. Before 2003, Vermont was the only state with so-called constitutional carry. 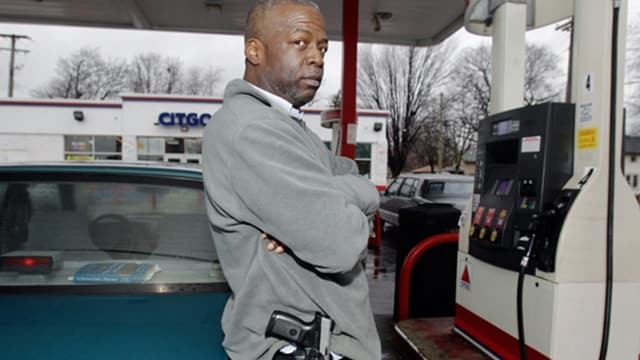 Now 11 other states allow residents to carry without a permit. Several other states have loosened permitting requirements so far this century. In 1999, 2.7 million Americans had concealed carry permits. By 2016, that number had shot up to more than 14.5 million. “In light of the increasingly permissive concealed carry laws in the United States that we have observed over the past thirty years, it’s important to first, not only document the scope of this particular behavior that we did, but also take the next step and think about how this particular behavior may impact public health and public safety,” said Ali Rowhani-Rahbar of the University of Washington, the lead author of the study.